Modern Staircases & Railings / Floating Stairs / Prefabricated Stairs: Mechanical or Welded? What Are the Types of Metal Stairs? What Is a Welded stair system? Are Welded Stairs more expensive than Mechanical Stairs? What is a Metal Prefab Staircase? A metal prefabricated staircase is supported by a metal stringer, and it arrives to your home or the jobsite ready to install. That means you’ll receive all your parts — stair treads, metal stringer, bolts and brackets — in clearly labeled boxes, ready to put together. What are prefabricated stairs? This term refers to a staircase that is manufactured in sections, and then shipped to your home in these pre-assembled parts. A prefab staircase cuts down on assembly time. Homeowners choose to go with welded or mechanical staircases for different reasons. But no matter which one you choose, it’s important to make sure that the stairs comply with building codes. Each metal stair system must meet either OSHA or IBC codes. Which code applies to you? That depends on your local building requirements. Take a look at this breakdown of building codes by state. Public and high-traffic areas tend to have stricter regulations than private, low-traffic areas that are only used by homeowners or employees. What are the different types of prefab steel stair systems? Wildeck, Inc offers steel welded stairs with either open or closed risers. Stair steps come in open (bar grate) or closed (diamond plate) versions. 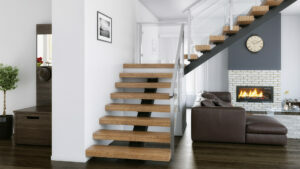 Standard stair width is 36” with custom widths available. Lapeyre offers pre-engineered steel stairs with a stringer and railing components. The treads are available in metal pan, diamond, bar grate, or grip versions. Stringers can be plated, channeled, or tubed. FSI Industries offers factory welded stairs with lots of different finish options. One additional benefit is the fact that these stairs have fire proof construction. The stair treads come diamond plate and bar grating, and they’re available in 36” and 40” widths. Special colors are also available on request. Other manufacturers offer a modern look with hand-welded stairs that are suitable for both indoor and outdoor projects. The entire stair unit typically arrives ready to install, making it entirely prefabricated. In general, the price of a welded prefab staircase will not be much different than the price of prefabricated bolted stairs. There may be extra labor costs for the former, particularly if they have to do welding onsite — and there may be additional cost in the components themselves for the bolted connections. Variations of welded prefab stairs can run anywhere from $3,000-20,000 — while mechanical stairs typically run around $12,000. What is a mechanical stair system? Also known as a bolted staircase, mechanical stair systems are made from metal. They are pieced together using bolts and screws and then attach to steel tubing. One major benefit to this is that the stair stringer can be shipped separately from the treads and components. This makes it simple to assemble on site, and reduces the risk of shipping damage. What are the similarities & differences between the two types of stairs? A mechanical stair system uses bolts and screws to be mounted into place and do not require special metal fabrication . Both types of systems use stainless steel. The mechanical stair system features many of the same components that a traditional, welded staircase would use. For example, each type of staircase comes with tread brackets, header plates, and footer plates. Finally, both mechanical and welded systems meet the same code guidelines. They both must adhere to the 4” sphere rule, and must be able to hold up under certain weight limits. Every aspect of the staircase’s design is crucial––from the design of the individual parts themselves, to the way each piece connects. Each element is made from high quality materials and designed in such a way that it is both easy to install, and pleasant to look at. What are the bolted connections? The prefabricated staircases arrive in essentially 4 main parts: the stringer, the header plate, the footer plate, and the tread brackets. The stringer is the long metal piece that makes-up the backbone of the system. Traditional staircases hide their stringer inside of a wall, whereas floating staircases incorporate the stronger into the design. The header and footer plates attach the stringer to the top floor (or header board) and bottom floor, respectively. 6 bolts pass through each plate to connect the stringer to the foundation, and allow the system to exceed 5x the recommended weight pressure. The tread brackets hold each tread in place and attach mechanically to the metal stronger tubing. We use high-quality grade 8 bolts for every connection to ensure that every piece of the prefabricated staircase is sturdy and secure. These tempered steel bolts are the strongest bolts available in the United States, and can withstand incredible amounts of tension without breaking or fracturing. We also apply a special adhesive to each bolt. This process, known as thread locking, helps to prevent leakage, corrosion, and loosening over time. Thread locking is the ability to improve the quality of the bolt connections by attaching a special adhesive. The special adhesive applies directly to the bolt’s threading. This way the binding at the connection point is the strongest possible. In addition to using high-quality bolts, further engineering happens to connect our components, by a process known as flow-drilling. Traditional welding methods cause distortions where the two metal parts join together; this affects the look of the overall design, and can be hard to cover-up. By utilizing flow-drilling instead of welding, we remove the “scar” where the metals meet, and instead create a threaded hole where a bolt can easily be inserted. A bolted stringer, through the process of flow drilling, is also easier to ship. Without pre-attached brackets bulking the size of the product, we can ship the prefabricated stringer and brackets separately, and the customer can easily bolt them together on the job site. Mechanical and Welded prefabricated stairs are both great options for a staircase, but both have different benefits that may make one system more appealing over another. Both are safe, beautifully designed, and ideal for a modern home. For more information check out our related articles. Need Help? Request Help from our Experts.